The incidence of nonpuerperal cerebral venous thrombosis (CVT) is emerging nowadays. However, statistical data are lacking. Isolated CVT due to secondary polycythemia and long existing Tetralogy of Fallot (TOF) is a rare kind of presentation. We present a 62-year-old female having uncorrected TOF since childhood and later developed secondary polycythemia. 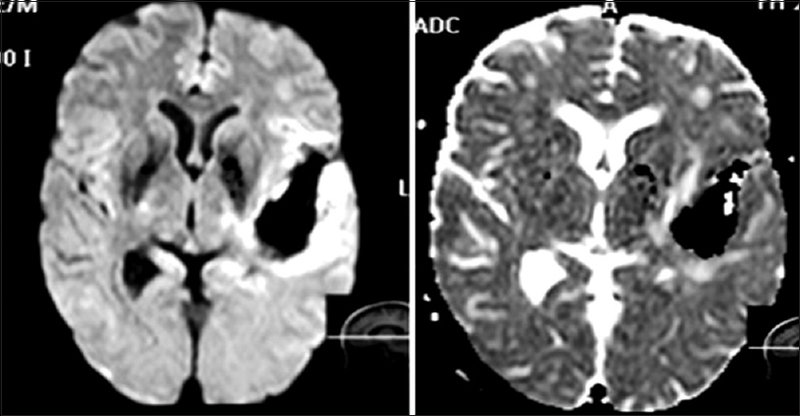 In old investigations, she had minimal cerebral arterial thrombotic evidence on radiological imaging and clinical manifestations. Now, she presented with CVT despite anticoagulation for five years. A 62-year-old female, vegetarian by diet, presented to neurology emergency department with a history of a headache and vomitings for 2 days followed by status epilepticus. After initial treatment, she became symptomatically better except with complaints of a persistent headache. A detailed examination was not suggestive of any focal neurological deficits with normal fundus. 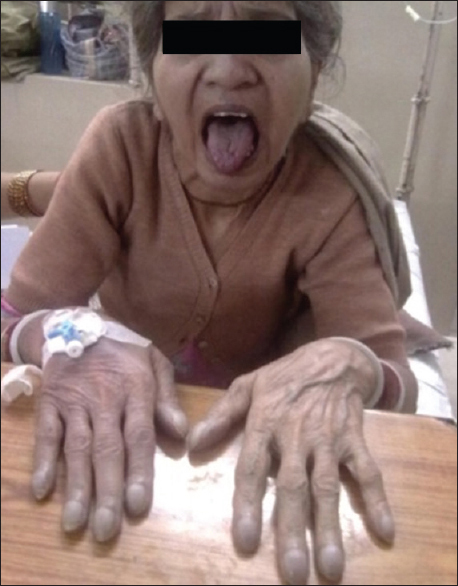 She had a history of two seizure episodes, although, of minor duration during the past 6 months and one episode of motor aphasia 6 years back which recovered over few weeks. She was a diagnosed case of TOF since childhood and was on medical therapy alone without surgical correction due to her mild nature of symptoms. There were no visible signs suggestive of infective endocarditis. There was no history of any other medication such as oral contraceptive pills, history of vomiting, or diarrhea. Serum homocysteine level is normal, sickling test is negative, and all other routine investigations are normal. Due to long-standing TOF, she developed clubbing along with cyanotic facies [Figure 1], transient atrial fibrillation, and secondary polycythemia. She was on oral anticoagulation for 5 years with target prothrombin time international normalized ratio (PT-INR) range between 2 and 2.5. She had been underwent three times phlebotomy. Her investigations revealed hematocrit value of 68.4%, hemoglobin 14.1 g/dL, mean cell volume 69.1 fl (83–101), and PT-INR 2.3. Blood culture reports were within normal limits. Ultrasonography abdomen was suggestive of Grade 1fatty liver without any evidence of hepatosplenomegaly. Cardiac color Doppler revealed TOF without any evidence of thrombus or vegetation [Figure 2], magnetic resonance imaging (MRI) brain showed hemorrhagic infarct at left temporal region. MR venogram revealed left frontoparietal cortical vein, and transverse sinus thrombosis [Figure 3] and [Figure 4] and an angiogram was found to be normal. The patient was started on low molecular weight heparin followed by continued oral anticoagulation with a target INR of 2.5–3 which was little higher than the previous target. The patient improved symptomatically during hospitalization for 12 days and was asymptomatic without any complications during the 3 months follow-up period. Stroke and brain abscess are the most common neurological complications of uncorrected congenital heart disease. Corrected as well as uncorrected cases of TOF are associated with increased risk of developing pulmonary thrombosis, venous thrombosis, cerebral embolism, and infective endocarditis in young and adult populations., The mechanism is long-standing cyanosis leading to polycythemia, which increases the risk of thromboembolism and cerebral infarction. Stroke due to cerebral arterial thrombosis (CAT) has been attributed to the secondary erythrocytosis due to cyanotic heart disease, which is pathologically different from primary erythrocytosis of polycythemia vera. An association between elevated hematocrit and thrombosis has been established in polycythemia vera. However, no association has been established between elevated hematocrit and secondary erythrocytosis in case of cyanotic heart disease. It is an unusual manifestation of TOF to develop isolated CVT in elderly person without any manifestation of CAT. Polycythemia is not only a risk factor for the development of venous thrombosis but also a mimicker of the same and if these two conditions coexist, as in the case of TOF, the differentiation between the two is only possible by contrast-enhanced computed tomography scan or an MRI. The incidence of nonpuerperal CVT is emerging and exploring. Due to long survival TOF isolated CVT is a rare kind of presentation. However, she had minimal CAT evidence on radiological imaging, but clinical manifestation was less than expected in hyperviscosity syndrome. This case has two unusual aspects: first is long survival of TOF and presenting with isolated CVT and second being the development of CVT despite normal desired PT-INR. Hence, one can assume that either secondary polycythemia requires high optimization of PT-INR or phlebotomy would be better treatment option rather manage PT-INR. Our assumption is further supported by the fact that during the past 6 years when she was managed on phlebotomy she was asymptomatic without any vascular incident despite having a high hematocrit (>60%). Hence, we hypothesize that long-standing TOF may present with isolated CVT. Kumar K. Neurological complications of congenital heart disease. Indian J Pediatr 2000;67:S15-9. Rose SS, Shah AA, Hoover DR, Saidi P. Cyanotic congenital heart disease (CCHD) with symptomatic erythrocytosis. J Gen Intern Med 2007;22:1775-7. New PF, Aronow S. Attenuation measurements of whole blood and blood fractions in computed tomography. Radiology 1976;121:635-40. Healy JF, Nichols C. Polycythemia mimicking venous sinus thrombosis. AJNR Am J Neuroradiol 2002;23:1402-3. Bhatnagar S, Naware S, Kuber R, Thind S. Pediatric stroke: Neurological sequelae in uncorrected tetralogy of fallot. Ann Med Health Sci Res 2013;3:S27-30.